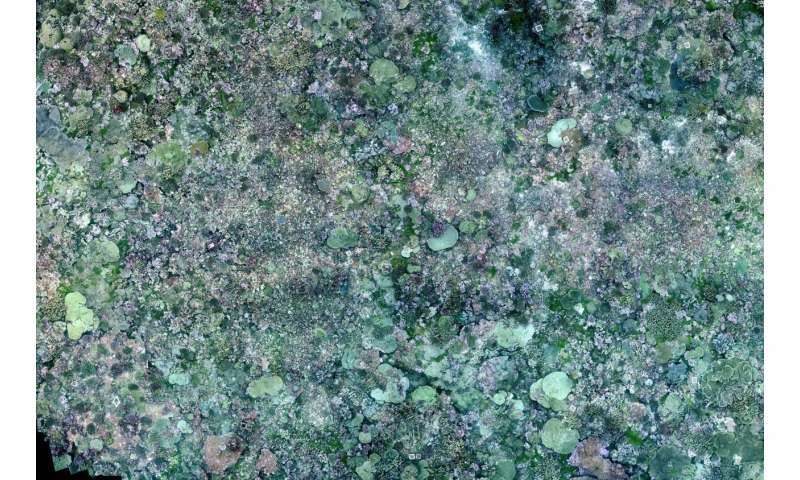 In a study published recently in Coral Reefs, scientists from the Scripps Institution of Oceanography at UC San Diego created and analyzed detailed photomosaics of the coral reef at Palmyra Atoll, and made surprising discoveries around coral spatial ecology. 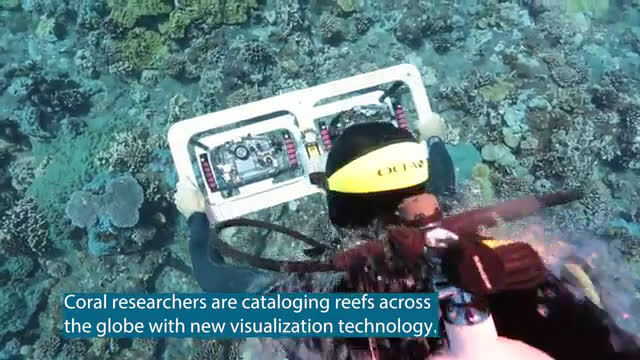 The scientists, led by graduate student Clinton Edwards, canvassed more than 17,000 square feet of reef, and 44,008 coral colonies, taking more than 39,000 images that were then stitched together to create 3D photomosaics that encompassed the reef. Edwards and his co-authors analyzed these mosaics and discovered that coral colonies on Palmyra's reef are arranged in a non-random way. They demonstrated for the first time that corals tend to be clustered together across the reef landscape, and that the strength of this clustering is tightly linked to the specific growth and reproductive strategy used by a given coral. Edwards said that based on what he'd observed during the many hours he'd spent analyzing the mosaics, he had a hunch they would see some evidence for non-random clustering. "I was, however, quite surprised to find so little evidence for randomness," he said. "There is a level of mathematical texture that the eye just can't catch and I don't think anyone expected such consistent results." Stuart Sandin, a professor of marine ecology at Scripps, who is Edwards' PhD advisor and senior author on the paper, says the mosaic technology can help scientists' understanding of marine ecology catch up with their knowledge of terrestrial ecology. To understand ecosystems on land, "we use aircraft-mounted cameras to take photos from ten thousand feet, and you can see where trees live and where they grow. And now satellites have even more comprehensive coverage," Sandin said. "That's a tremendous amount of data, and the sky's the limit for what we analyze and what we have learned about basic and applied ecology. Now you go underwater and the spatial data are essentially absent. What can we do? You have to start by trying to map it." Having an understanding of the overall landscape of forests and other terrestrial ecosystems has been very valuable for conservation and management of those environments. Now, Sandin says the detailed mapping from photomosaics of coral reefs could be used in the same way for management of marine ecosystems. "In coral reefs, one of the big worries is if a storm kills a bunch of corals, how do you get the corals back? One of the tools that we have is to plant them," Sandin said. "One approach that people have had is to say, well, each of these coral fragments I plant could become five square meters. That means I'll space them in a very regular way, and disperse them every couple meters." But based on what they now understand about coral spatial ecology, this approach could be problematic. "A forest where you plant trees too far apart, one wind storm comes through and the trees all fall over, because they depend on one another for stability. The same exact thing holds true for corals," he said. And that's not the only consideration. In a coral reef, as in a forest, there are rules that describe how densely or sparsely different species like to grow, how much they like being next to each other, and they often get ecological opportunities by living close to one another. 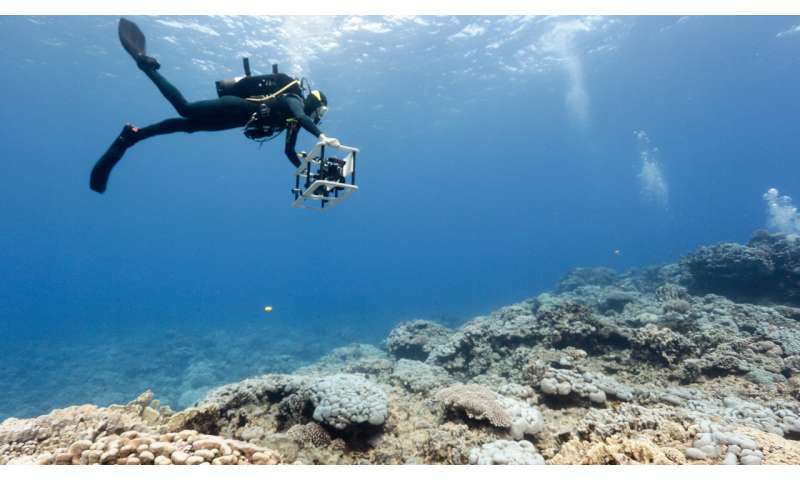 The photomosaics are helping coral ecologists decode how these rules structure a reef. Creating the photomosaics and wringing useful information out of them is a time-consuming process. During the data-gathering, the scientists generally do three dives a day, and it took more than five full days of diving to collect the images for the sixteen plots used in this study. Back in the lab, Edwards used a custom high-performance computing system to stitch together the 2,500-3,500 individual images that make up each mosaic. It takes the software several days to complete the rendering of the composite image, and around 100 hours to label and classify all the corals in each image. Then the final step is to extract the species information and analyze it, which takes another three days or so per image. Digitization of the images is clearly the limiting step, he said. But that may change soon. "We have excellent collaborators in the computer science and engineering department at UC San Diego, and are getting close to having a computer assisted workflow that will dramatically accelerate this process," Edwards said. Vid Petrovic, a PhD student in Professor Falko Kuester's lab in the UC San Diego computer science department who created the software that Sandin's team uses to visualize their 3D models, is working on creating a custom software for this purpose. "More and more imagery is being collected across the field of marine sciences, and the pace and scale of the effort will only increase—but more data doesn't automatically mean more, or better science," Petrovic said. "It's an honor and a joy to be working so closely with a group of marine ecologists to address this, developing collaboratively the tools and workflows that are needed to make productive use of the imagery, whether for monitoring reef health, or for advancing basic science." Photomosaic from the site FR3 on Palmyra. It was created from 2700 individual images. Photomosaics are generally formed from 2500-3500 individual images. Credit: Clinton Edwards. Scripps Institution of Oceanography at UC San Diego. Petrovic says the team is making it possible for scientists to virtually explore reefs in the lab, allowing them to time-travel from year to year and track the growth and decline of individual colonies, and to study spatial and temporal relationships across the reef. "We're speeding up the digitization and annotation, and clearing a path to letting machine-learning techniques carry more of this burden," Petrovic said. "This is all terribly exciting, and with much more to come. But the most rewarding aspect for me is the interdisciplinary collaboration that makes it possible in the first place, that lets us apply a decade of visualization research in support of vital ecological work." Edwards, Sandin, and their collaborators say they expect the photomosaic technology to lead to many more scientific discoveries, and to continue to aid in conservation efforts. The data collected on the Palmyra reef is part of the 100 Island Challenge, the goal of which is to create a global perspective on how coral reefs are changing over time. The 100 Island Challenge team, comprised of postdoctoral researchers, staff, and graduate students from the labs of Sandin and Scripps ecologist Jennifer Smith, is partnering with scientists and communities around the world to visit 100 different islands and use these novel 3-D imaging techniques to create photo mosaics capturing every detail of the coral reef structure and ecology. So far the team has visited almost 70 of the islands to capture mosaics, with a schedule to resurvey each site after two years. Back in the lab, they will analyze the mosaics to see how the reefs are changing over time, and how the variation of ocean conditions and human activities impact each reef. These images will also become baseline data for local agencies to use to study their own reefs. "What really excited me about the large-area photomosaic approach is that it basically lets you take the reef home with you," Edwards said. "When you are diving there are so many practical constraints to what you can do. You're limited by air, currents, surface conditions, and sometimes you don't have the opportunity to stop and smell the roses." He said that being able to spend hours slowly moving over the reef, carefully looking at thousands of individual corals, helps him see things that he would never have been able to observe in the field. "I've learned a lot while diving and would never trade those experiences, but the majority of my insights have come in front of a computer while digitizing these images," he said. "It's exactly this opportunity for new observations and new insights that is necessary to propel science forward," Edwards added. "I'm truly honored and excited to be a part of it."